Mr. D brought home some peaches from Costco this week that were absolutely delicious. After eating a few right out of the box, my mind started to wander on what yummy grub we could make with such a fresh and fruity find. Now we like our fruit pies around here, don't get me wrong, but there is just something about fragrant, super ripe peaches that lend themselves to turning into a warm, hot bubbly crisp. 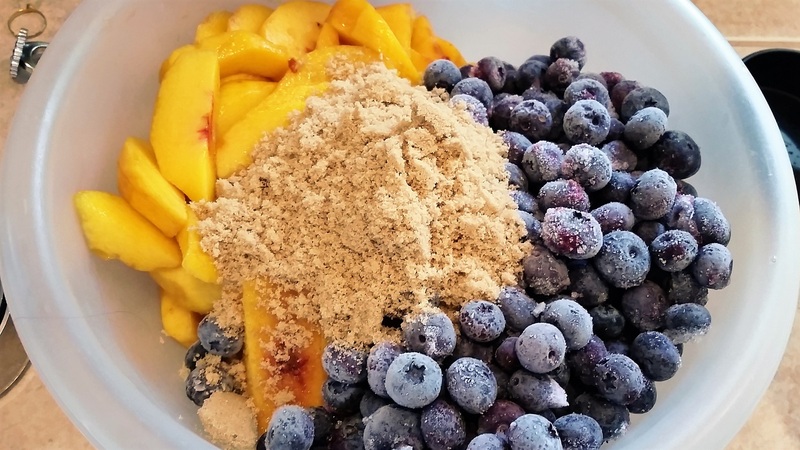 Throw in some blueberries we picked from this summer and you've got yourself one beautiful, tasty summer dessert. 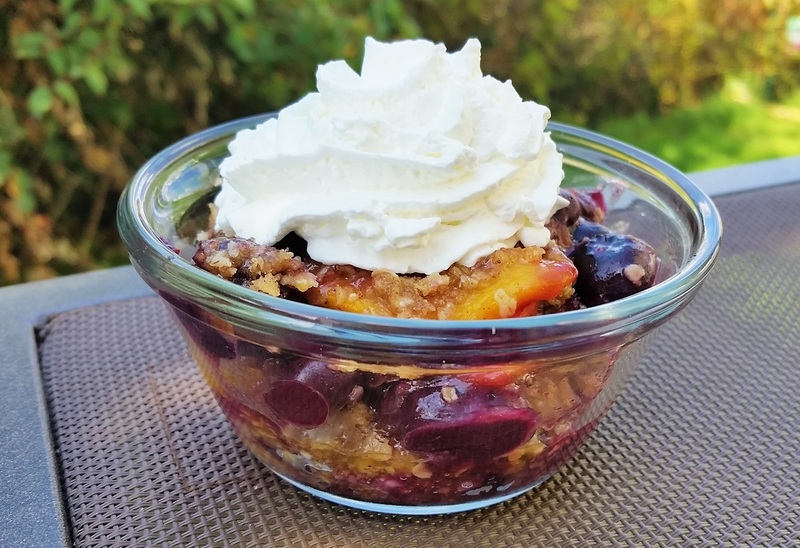 Peach Blueberry Crisp - the perfect summer dessert! 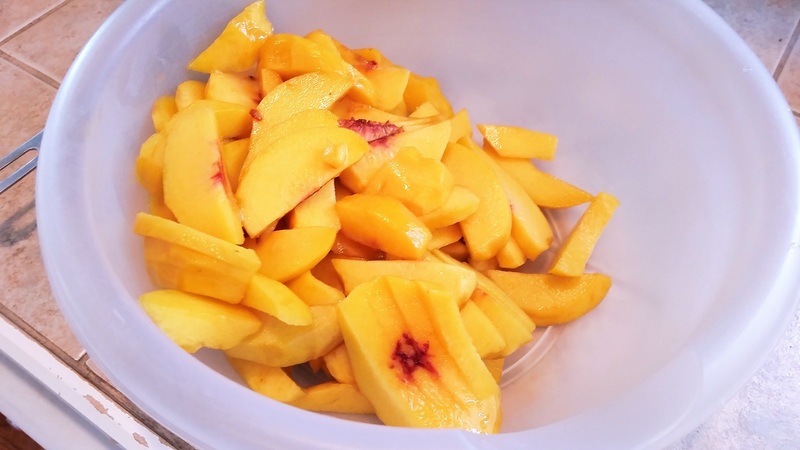 In a bowl, put the sliced peaches. Stir in 1 Tablespoon of flour or cornstarch as thickener and mix together until blended. Since our blueberries were frozen, I put this bowl sit to the side to let the berries come up to room temperature while we worked on the topping. 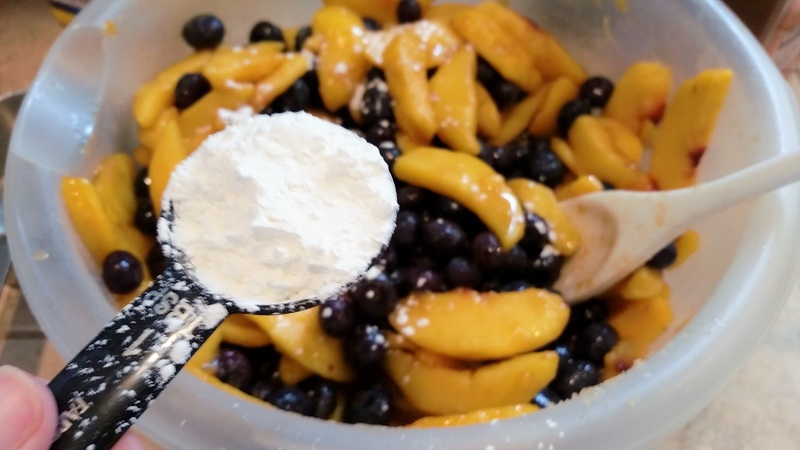 You can then also dump this fruit mixture into a 9x13 pan to await the fabulous topping goodness. 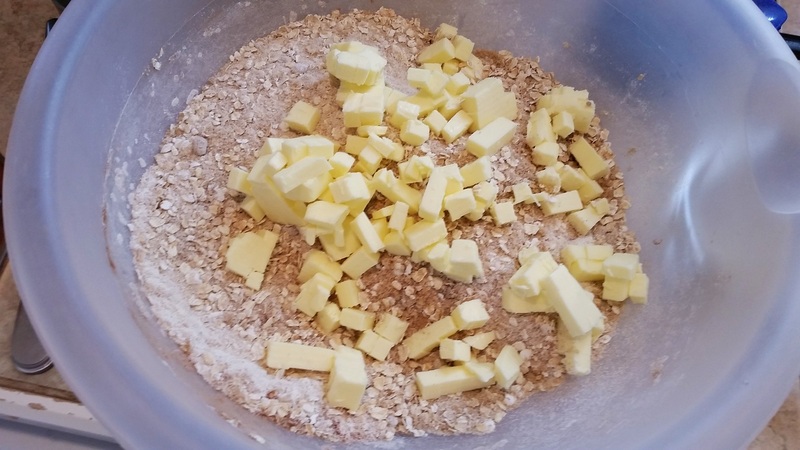 In another bowl, add 1 1/2 cups of quick or rolled oats. 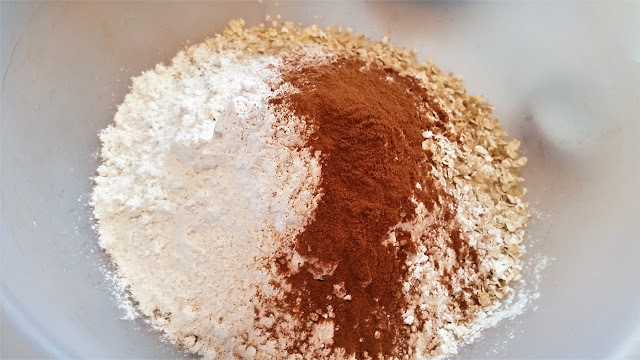 Add 1 cup of brown sugar, 2 teaspoons of cinnamon, 1 cup of flour, and mix until combined. Drop in 1 and 1/2 sticks of chilled, cubed butter. Use a pastry dough cutter to mix the butter into the dry mixture until it resembles coarse crumbs, then dump over the fruit mixture in the 9x13 pan, and pat down firmly. Heat the oven to 425º and place in the center of the oven. 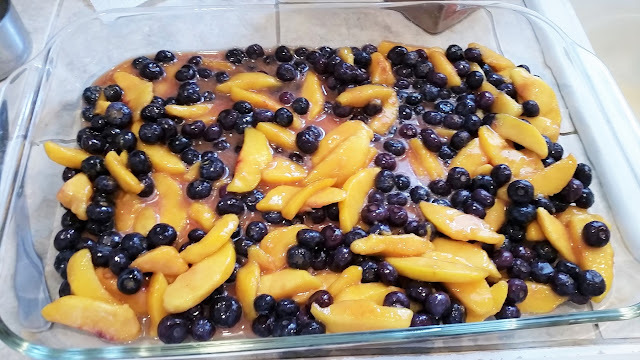 Bake for 30 minutes or until golden brown, bubbling, and the fruit is cooked through. Let it cool at least 15 minutes before serving. 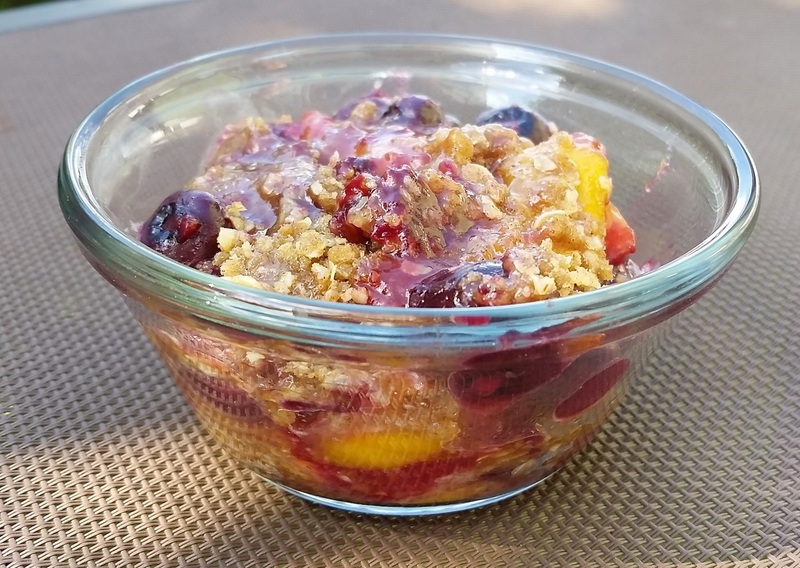 Delicious hot peach blueberry crisp! Serve with whipped cream or a scoop of homemade vanilla ice cream. This turned out quite delicious and we ended up having some the next morning for breakfast too, I mean, come on, fruit, oatmeal... it's practically the breakfast of champions, right? If you are lucky enough to have any leftovers the following night, put a scoop in a microwave safe bowl or plate and nuke for 30 seconds to heat it back up and then top accordingly. 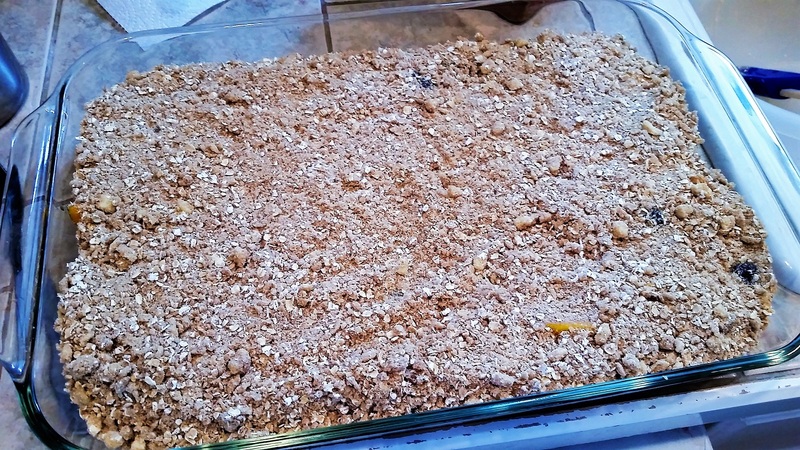 For full printable recipe, click HERE.